With an average elevation of 4,900 meters (16,000 ft), Tibet is the highest region on the face of the Planet, and for this reason, is sometimes referred to as the roof of the world. The entire Tibetan plateau is of much significance to the Indian sub-continent especially because of its strategic location for the region. Several major rivers in South Asia originate from the plateau thus making it a giant water reservoir. These rivers feed over millions of people who depend on them for their survival and livelihoods. Rapid, anthropogenic, unplanned and short sighted activities in the Tibetan plateau will invariably have an immediate adverse impact on the economy and environment of all of Asia. With this as the backdrop, Delhi Greens along with Friends of Tibet (Delhi), and with support from Indo-Tibet Coordination Office and India Tibet Friendship Society organised a film screening (of Meltdown in Tibet), talk and discussion on the issue in Hindu College, University of Delhi. Held on 16th December, 2010, the objective of the event was to help raise awareness on the Tibet region and emphasise upon its geo-political significance in the wake of oncoming water crisis and climate change. At the forefront of the impacts of this change is India, where not only do rivers feed millions of its citizens, they are also of religious and cultural significance. The program was therefore also structured to discuss the issues of damming of the Tibetan rivers and the consequent water scarcity in South Asia in the near future. Bhavna Singh, a Research Scholar at JNU, who was also the key speaker at the programme, highlighted the extreme significance of Tibet in the geopolitical scenario of South Asia. Her presentation reinforced that the recent happenings in Tibet, with regard to economics, environment, and culture are changes that are deep seated in the plateau and will directly impact the set up in India. Despite all this, China–presently in control of the Tibetan Autonomous Region (TAR)–is going strong with its dam projects along the entire stretch of the Tibetan plateau. This was illustrated in the film ‘Meltdown in Tibet’ by Michael Buckley (Wild Yak Films) which was screened as part of the event. A personal take by its maker on the politics of water in Tibet, the film uses undercover footage and stills to blow the lid off China’s huge and potentially catastrophic dam-building projects in Tibet. The film succeeds in showing how Tibetan nomads are being forced off their traditional grassland habitats and resettled in regions where they cannot make a decent living, all so as to make way for the hydropower projects and mining ventures. To begin the discussion that followed, a reality-check was done with the audience to understand their knowledge and awareness about the Tibetan issue. An attempt to make a greater linkage between the audience and the issue at hand was made by discussing places like Dharamshala and the Samyeling Tibetan Camp at Majnu Ka Tila, Delhi. Participating students also informed how they were enchanted by the lecture delivered by His Holiness the Dalai Lama at the Vice Regal Lodge of the University of Delhi.The audience, which also included students from Korea and Bhutan, seemed aware of the issue though had some confusion about facts and relevant information. The first question raised from among the audience was to inquire how real the threat of damming of rivers in Tibet by China is? 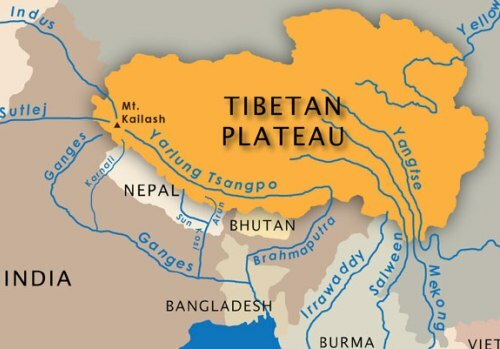 They were informed how the damming or rivers in Tibet was an issue of political as well as environmental concern and while the country most impacted by it will be Bangladesh, the largest impact will befall on India. The large number of environmental refugees who will enter India from there will is surely an issue of grave concern for India. Further discussions happened on India’s stand on the Tibet issue, the environmental impact of dams upstream of the country, China’s policies in Tibet for controlling its natural resources and the sustainable development in the context of South Asia and the Indian sub-continent. There was also a general understanding in the audience about the human rights violations in the Tibet Autonomous Region (TAR) and many wanted more clarification on how ‘autonomous’ is the TAR in actual terms. On the whole, the organising of the ‘Film Screening, Talk and Discussion’ helped a major group of diversified students understand, appreciate and come closer to the issues and concerns of Tibet and its people. This will surely help in furthering the cause and in involving people from India towards peaceful and timely resolution of the Tibetan issue. Image courtesy MeltdowninTibet.com and is for reference to the Tibetan region only. Delhi Greens does not approve or conform to the Indian border in the said map or on other maps on the site. Delhi Greens would like to thank the Zoological Society, Hindu College, University of Delhi for their kind cooperation in the organisation of this event. NextDelhi Greens Blog Wishes Merry Christmas to All its Readers!